"The Multicultural Canada digitization project grew from a conviction that the cultural groups that make up Canada have little-known stories that need to be researched and told. Through newspapers, interviews, photographs, print and material culture people tell us who they are. Yet research into Canada’s multi-ethnic communities has been hampered by the relative lack of availability of non-English language materials and other artefacts originating from minority groups. . . . . "
I found the following four articles on Greek's in Canada that you can view online. "Elusive Community: Greek Settlement in Toronto, 1900-1940"
"The Experience of One Teacher in Greek Communal Schools"
"Greek Immigrant Women from Asia Minor in Prewar Toronto: The Formative Years"
"The Greek Ladies' Philoptoko Society: Its Early Years in Toronto"
At the bottom of the page there are links to each section - every page is scanned and available for viewing online. As always, good luck with your Greek family genealogy research. Years ago I saw this idea somewhere and always kept it in the back of my mind as something I would like to try one day. Well today was the day. I took a photograph of my yiayia and papouli and pasted it into a word document, resized to approx. 2" wide and inserted some facts: names, date of marriage, name of church and location. I printed it, cut it to the size I wanted for a bookmark, and took it to the local office supply store where they laminated it for me. It turned out great! I can have 6 bookmarks laminated for about $1.10 (they charge by the page). I have been trying to come up with some ideas to get my nieces and nephews interested in their Greek family history, so I plan on making a series of these to include grandparents and great-grandparents from both sides of the family. I think I will give them out at the next holiday get together and stimulate some conversations and story telling. For those of us who are not fluent in reading Greek, I have found a few good tools for translating online websites. You can start by going to Google's online translator and insert the url of the website page you want translated. It won't be a perfect translation, but it will allow you to understand the basics. In many cases there will be portions of the page that aren't translated by the Google translator. For those parts I like to use Yahoo's Babelfish translator. I just copy and paste the text I want translated into the box and select translated from Greek to whichever language you desire. I would love to hear about other online translator's that you have found helpful, so submit your comments and let's continue sharing our experiences with Greek family genealogy research. Airing on the National Geographic Channel - August 30, 2009 at 8:00 p.m. (check local listings for times) - "The Human Family Tree". "Retrace the deepest branches of the human species to reveal interconnected stories hidden in our genes". George is a 63-year-old retired community district manager in Astoria, Queens. After 37 years on the job, he is like a mayor emeritus of the area. George was born in Greece and moved to the United States after World War II. An avid collector of ancient Greek artifacts, he traces his family back to Asia Minor. The results of his DNA test show that he belongs to haplogroup R1b, one of the most common European lineages. His ancestors were among the first modern humans to settle in Europe more than 30,000 years ago. I am finally finished with the update to the HellenicGenealogyGeek.com website. As usual, this project took longer than expected. I feel like it was similar to starting a project to fix something in the kitchen, you know, the kind of project that should take 10 minutes, but ends up taking all day! I have added to the basic Hellenic Genealogy Geek information by including links to outside sources of information and books that you may find helpful with your research. Here is a summary of updated website links to-date. I recently found the following websites that have many maps covering the last 300 - 400 years. From what I can tell, you have the ability to zoom and print on all. Hope you will find these links helpful. Hi EveryoneHere’s another tool to help you with your Greek Genealogy research. The chart is too large to include in this post, but you can access it through the following link - Greek Masculine Given Names in both Greek and English - at the HellenicGenealogyGeek.com website. The chart includes: Greek Masculine Name & Variations, Greek Abbreviation, English Transliteration, English Abbreviation, and English Counterpart. Hope you find this helpful. Good luck with your continued Greek Genealogy research. 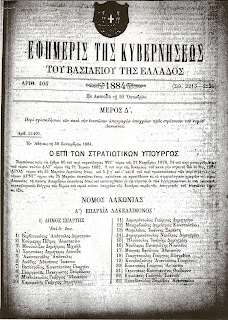 In order to utilize most of the records from Greece, whether requests directly to the local authorities in Greece, online Greek newspaper searches, or records held on microfilm at the LDS Family History Library that are available for your use, you will need to know how to spell your family surnames in Greek. In an effort to provide tools that will help you with your research, I have listed below 113 surnames in both English and Greek. Good luck with your continued Greek Genealogy research. I was at my Aunt’s house last week and remembered that she had the Funeral Register (or Guest Book) from my paternal grandfather’s wake in 1964. I sat down with her and my mother and we went through the book. What a great find! Not only did it help them remember stories, but we ran across names of cousins and spouses on my father’s side I didn’t know about before. Ask around and see if one of your family members is in possession of the Guest Book from one of your relative’s wake. It’s a great way to help your older relative’s remember stories you would love to hear.Good luck with your Greek genealogy research. Sometimes we forget to check the basics. I live in the Chicago suburbs and my local library has archives of the Chicago Tribune Newspaper all the way back to the 1800’s. I was tired of looking at some LDS records I had been working on, so I looked up my grandmother’s obituary. I thought I knew absolutely everything it would say. To my surprise, it listed the last name of my remarried great-grandmother. There was a new piece of information I didn’t have before! Hellenic Genealogy - "Pass It On"
When I was young I didn’t know that I would regret not talking to my yiayias and papoulis about where they came from in Greece and asking them to tell me their stories. All four of my grandparents are long gone and this is something I cannot recapture. As I got older I tried talking to my parents and other relatives about what they knew - to my surprise, they didn’t know much! They never took the time to talk to their parents about such things. Share with your children and grandchildren. Whether they realize it or not – they WILL appreciate it later on in life, and remember the wonderful talks you had and the things you told them about their background. What was your actual family name in Greece?